The challenge runs from 1 May 2014 until 31 August 2014, with only books read during that time being allowed to count. All the books have to be at least 200 pages long and there are 12 categories that need to be fulfilled to complete the challenge. 5 points: Freebie! Read any book that is at least 200 pages long. The Fault in Our Stars by John Green, because it’s been on my list for way too long now! Flowers for Algernon by David Keyes (published 1966) if I can get it – I’m not finding it on Amazon Germany. If not, I’ll go with Rosemary’s Baby by Ira Levin (published 1967). The 131⁄2 Lives of Captain Bluebear by Walter Moers. Jan and I started reading this book years ago but we never actually managed to finish. Time to try again! (The first one that came to mind was The Silmarillion, but I’m convinced it’s not even possible to finish that book!). I read children’s books allll the time, well young adult literature anyway, which I assume is in the children’s section at the library? But here’s one from my Amazon wishlist: The Mysterious Woods of Whistle Root by Christopher Pennell. It claims to have 224 pages and be for ages 9-12, so it’s perfect for the challenge. 15 points: Read a book that is on The New York Times’ Best Sellers List. 15 points: Read a historical fiction book that does not take place in Europe. Hmm, I’ll have to find one first! Ooh, I’m excited to see what others recommend! The Murderer’s Daughters by Randy Susan Meyers has been on my list for ages! Perfect opportunity to finally read it. 20 points: Read a book that will be/was adapted into a film in 2014. Errm, I’m hopeless with films so first I’ll have to discover what’s even coming up this year! 25 points: Read a book by a blogger. I can’t think of any! Suggestions? 25 points: Read a biography, autobiography or memoir. Captain James Cook by Richard Hough. And it’s non-fiction so I get to count it towards my 35 before 35, too! 30 points: Read a pair of books with antonyms in the title. 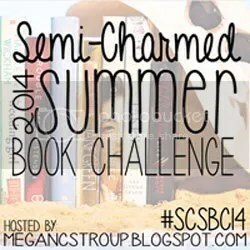 The challenge is being hosted by Megan at Semi-Charmed Kind of Life. I know it’s 1 May is tomorrow (I only found out about this today! ), but I’m sure there’s still time for you to join in if you’re quick! You can also follow along on Twitter via the hashtag #SCSBC14. Previous postWhat can go wrong with tinned tomatoes? Ooooh! Great idea for a challenge! Way to go 🙂 Love it! YES! I was just telling Steven and Kathleen to read The Fault in our Stars the other day!! Are you prepared to cry ALL THE TEARS?! Yes, I’ve been warned about the tears. And I cry really easily at books. Aaargh! What am I letting myself in for? I think there will be the The Fault in our Stars movie. Can you count it twice? 🙂 I really loved that book and I usually don’t like YA books very much. What a fun challenge! I might have to join! I am sure you can still use another one as the freebie! 🙂 Do you know The Unlikely Pilgrimage Of Harold Fry? Oh wow interesting challenge! Don’t think I would participate as I don’t read much anymore. But a book by a blogger – all I know is Manda from BreakTheSky.net has a published book. Good luck with your challenge! Oh yes, I’d totally forgotten she has a book out! I’ve decided on Hyperbole and a Half now though. Checking out your list from the linkup. I LOVE your choices for books written before you were born. Flowers for Algernon is such a wonderful book and I hope you find it. If not I’d be interested in a review of Rosemary’s Baby! So excited to have you! Hopefully you can get some ideas for your incomplete categories by checking out the other preliminary lists. 🙂 Good luck! I have ordered the book now, but thanks. I have Captain Bluebear in English for some reason (it was a gift) so will be reading that. great picks – i think you’ll love the fault in our stars!